One of the most amazing secrets about Paris was imparted to me in the first week after I moved there. At a dinner party, a well-known French author/photographer of luscious French coffee-table books told me, "All courtyards in Paris are legal to enter if the courtyard door opens. It's the law." I was still bashful about the notion, but somewhat emboldened to give it a try. Because, of course, some of the most fabulous intimate outdoor sights in Paris are hidden from view from the casual passerby, and require some knowledge and audacity in order to see them. Mostly we spend our days in Paris walking down the cold stone sidewalks and simply wondering about the greenery on the other side of the wall. I spent three happy years in Paris on my daily walks trying my best to discover all those hidden spots that serendipity tossed in my path. But who needs serendipity when you have a copy of Hidden Gardens of Paris? 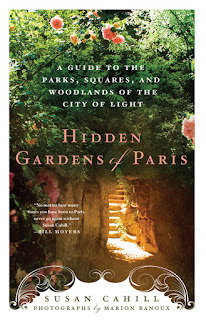 The hidden gardens included in this great guide range from not-so-hidden (Luxembourg Gardens) to tucked-away treasures, and I can only say that I am never going to meander around Paris again, EVER, without this gem of a book in my arsenal. Author Susan Cahill artfully organizes the gardens geographically around Paris, and includes places and restaurants to visit nearby. "Aha!" you might say, "She didn't include one of my favorites!" And, yes, it's true, because Paris has so many wonderful hidden green spaces, how could any 220-page tome include them all? (Picpus Cemetery is one of my favorites, for example.) But you will not be disappointed - there are ample new places to discover. This book will simply give you more reasons to keep discovering Paris. Hidden Gardens of Paris includes so many cultural and local references, it really is a must-have for any trip to Paris if, like me, your vision of Paris includes exploring on foot, outdoors. As an ardent francophile, I've loved French movies since I can remember. So I finally learned enough French to catch up and be able to understand French movies in French. Alas, the same is not true for many English-speaking francophiles around the world whose French isn't quite up to the task of understanding a French film without subtitles. Double-alas: too many wonderful French films that don't reach the mass-distribution market abroad are missed by these francophiles because the films are rarely released with subtitles in English. Even worse, they are not available in France to the non-francophone population. Honestly? I don't get it. Why not share the culture even if others don't get the language? Really, think of the scores of Amurican movies that are subtitled in French for French audiences each year. Why not subtitle French movies for American/all-other-anglophone-audiences? It might help to bridge the cultural gap! Yet these French films, which convey the sauce and substance of daily French existence, and the comedy/tragedy therein, are virtually unavailable to those who do not speak the language. With one exception, at least this week. Enter In French With English Subtitles, a New York-based group that for the past several years has been offering a French film festival featuring some of the sweet and wonderful French films that don't hit the mass-market distribution cinemas in the U.S.
Tonight is opening night of the In French With English Subtitles festival. Because I'm a procrastinator I've been crazy busy at work the festival is such a hit, I didn't get to score a ticket for tonight's opening Gala with Gad Elmaleh. But there are lots more for New York-based audiences to view this weekend. Some for the first time in the U.S. And with four screenings each day on Saturday and Sunday, there are many great films to see. I can't wait. All screenings are at the Florence Gould Hall of the French Institute Alliance Francaise, although the festival is not a part of FIAF programming (i.e. no reduction for FIAF members). An Award for Books about France! If you've read this blog with much frequency (and of course you have!) 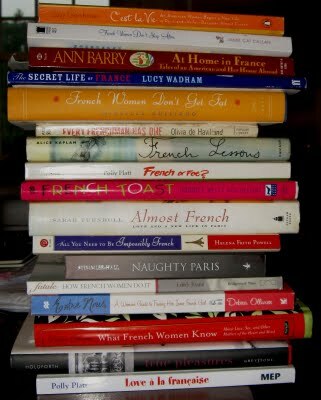 you'll know of my unending love of books written about France -- or the discovery of some aspect of France -- by Americans. Over the last two centuries, many great (and some not so great) works have been written for the anglophone world to explain or showcase France in a way that helps them appreciate or understand France a wee bit or a lot more than they did before. I have kept a personal library of them, made a habit of collecting and reading them. To see the vast numbers of books that I have written about in my casual way, check here, or simply click on the category "literature" in the column to the right. This year I was dreaming and scheming about the fact that this literary genre -- whether fiction, non-fiction, or coffee-table book -- should be awarded a prize in the great tradition of literary prizes. I came up with a well-laid-out plan. Alas, I did nothing with it but mention it briefly to a CEO of a New York-based French non-profit. Busy with the day job. I figured, I'll get around to it. But great minds, apparently, think alike. So imagine my delight last month when, at a NYC gathering for my beloved American Library in Paris, I heard the announcement from Director Charles Trueheart that ALP is now sponsoring the American Library in Paris Book Award. The award will be given each year to "...the best book of the year in English about France or the French-American encounter." It is, quite simply, thrilling to have the genre recognized and awarded and by such an august organization and writers' council. A vos plumes, everyone. A vos plumes! From London to Paris Photo? M --, a dear friend in New York, called this evening as she was heading to JFK to go home to London, to see her mum. M is a superb photographer, and does know Paris a bit. She had hopes to see Paris Photo next weekend but wasn't sure of how to make it work at the last minute. "Polly, darling, can you help me?" asked M. "Just the logistics on getting to Paris Photo from the Eurostar. Last time I went it was in the Carrousel du Louvre." Not sure of internet or time availability in the next few days, she needed Polly-Vous Francais to the rescue, and to email her all the information. This is my idea of the best possible way to spend a Sunday afternoon. Thursday 15 Nov. - Sunday 18 Nov. From noon till 8pm. Follow the Gare du Nord station exit signs for “Est” onto rue de Dunkerque, then go left onto rue du Faubourg St Denis. Walk about 200 meters to the bus stop. You'll want the # 42 bus heading toward ("direction") “Hopital Europeen Georges Pompidou." You can buy the ticket on board the bus (1,7 euro) with exact change (as long as you say “Bonjour, monsieur” to the bus driver first!!) or buy in the train station at a place that says "tickets RATP." Take the bus (about 18-20 minutes) and get off at the stop “Champs Elysees-Clemenceau". The Grand Palais is to your left as you look up the Champs-Elysees. If you want to have lunch when you arrive, a great cafe is LeMinipalais, which is located in the Grand Palais itself. It opened a few years ago and is quite good - fabulous decor and setting, and delicious food. I don't know how crowded it will be during Paris Photo. Otherwise, if you take a slightly later Eurostar, of course you can always lunch on the train. Is the Eurostar train food good? By the way, there are some great local restaurants near the Gare du Nord, but they are cheek-by-jowl with others that are too touristy and lackluster; so I think better not to waste time figuring those out. 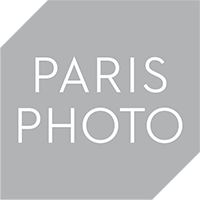 If you finish at Paris Photo and have some time left over before you head back to London, across the street at the charming and glorious Petit Palais there are also some photography exhibits, and entrance is free for the permanent collection, and very reasonable for special exhibits. Discounts for those who are 60+, but you are so young... I'm not asking! And of course my beloved Pont Alexandre III is right there. You must take at least a quick stroll, and take some photos. Have a safe trip! I hope all is well with your mother! Did I forget anything? any other recommendations for M? Veterans' Day. Armistice Day. In French, le onze novembre. A day to remember all soldiers who have fought to protect their countries. 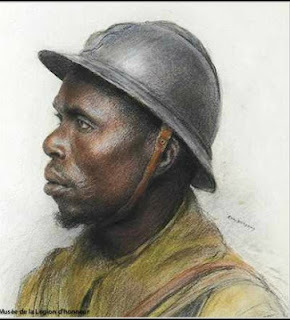 But the significance of the historic date November 11, 1918, is one that should be retained. Please pause and take a look at the images of these soldiers who fought in World War I, known in France as the War of 1914-18 (La Guerre de quatorze-dix-huit, or La Grande guerre). 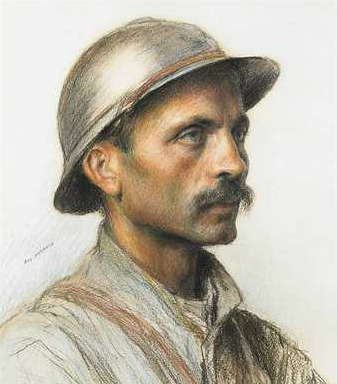 There are virtually no veterans now remaining from the Grande guerre. But I remember hearing a story or two when I was on my junior year abroad. 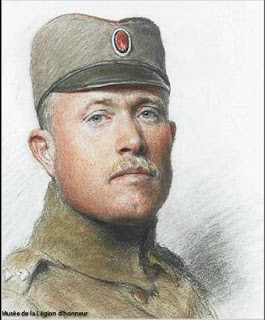 In France, on November 11, 1918, across the country church bells were rung at 11 a.m. -- the eleventh hour of the eleventh day of the eleventh month -- in honor of the 18 million who died and the millions who were wounded during that four-year war France as a country would never be the same. These images come from the Musee de la Legion d'honneur (Museum of the Legion of Honor) which, if you are in Paris, is an important place to visit. Right next door to the Musee d'Orsay. Entrance is free. The French W: did you say "dooblah-vay?" The other day my laptop keyboard was getting cranky, and inexplicably stopped producing the letter "W" unless I bore down with my ring finger's brute force. This situation, while annoying (I prefer to ignore that left-hand finger) and a bit embarrassing at first (sending "no" when you mean "now," or "itty" when you mean "witty," can get you in some hot ater! ), it also got me thinking about missing letters, and especially the letter "W."
It naturally conjured up the decades-old incident about the departing Clinton White House staff removing the letter "W" from keyboards in anticipation of Dubya and the gang moving in. That anecdote got blown out of proportion, then of course had a full-fledged government commission report. The initial response in the link above is my preferred kind of playful poisson-d'avril kind of fun. But ultimately, all of my thought-roads lead to French. Bien sur! So as I pondered my own missing "W," I mused, "Well, it wouldn't really matter if I were writing in French, because there are precious few French words that begin with the letter 'W'." And of course in French the letter is double vé....double-V, not double-U. And yes, in fact, so there are so few W-words in French that they can all be listed on one page. Here they are. Check 'em out: there are some standards and some doozies! Week-end, wharf, wagon, web 2.0., whisky. Some are the usual suspects, but none are very French-sounding, eh? Except for wisigoth, and methinks even that is an alternate spelling. And words that simply contain the letter "W" are few and far between. Hmm: sandwich. Can you think of others? One thing I can vouch for: when playing French Scrabble, you definitely don't want to draw the "W" tile, except that it's worth a gajillion points. In order to confirm the status of the letter W in French, I plan to wander the streets of Nouveau York and ask random French people (apparently about 50% of the current NYC population, estimated from language overheard on street corners) their opinions of the lettre double vé and I'll report back. I don't expect a huge response. But you never know. Thinking of absent letters, I recently stopped by the library at the fabulous FIAF, and to my thrifty delight, I found, in their used-book-for-a-buck sale cart, an uncracked edition of La Disparition by Georges Perec. If you are not familiar with this work (or any of the oeuvre of Perec), it is a 305-page French novel written without using the letter "E."